from Grahame L. Newnham B.Sc. Typical serial numbers - 9.5mm models: 1950s - 2259, 9245, 9580; 9875; 1960s on - 10409, 10659, 10757 - 16mm models: 1950s - 3311; 1960s on - 12708, 13713, 14004, 14958, 613713, (many serial numbers have been harvested from the internet) - My Webo M cameras, past and present, are underlined. At a guess, maybe the M60 series began at 10000? 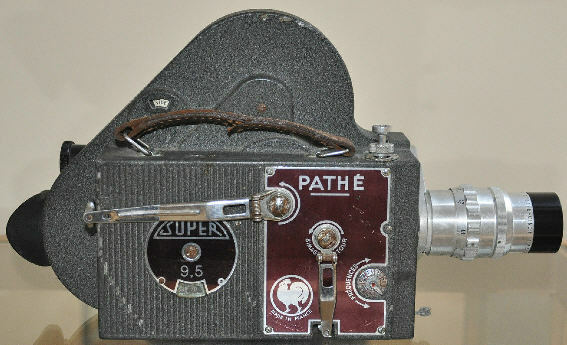 Pathéscope in the UK began importing the French made Pathé Webo M cine camera in 1951 in both 9.5mm and 16mm versions. 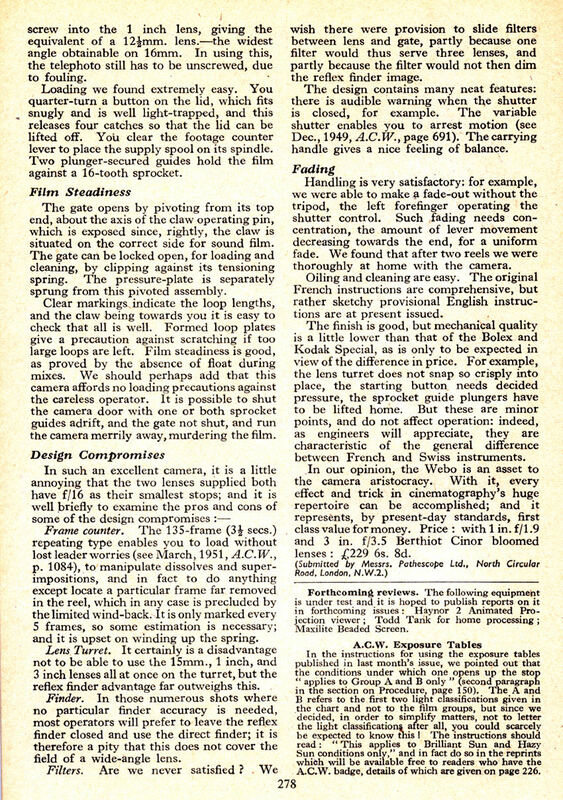 I guess specifications at that time were much the same for both gauges, although later minor mods and other upgrades were launched first for the 16mm models; in fact some mods probably didn't ever get to the 9.5mm versions, mainly because sales must have been much lower - certainly in France, where they even tried to use the 16mm models for professional work in newsreel and TV work. 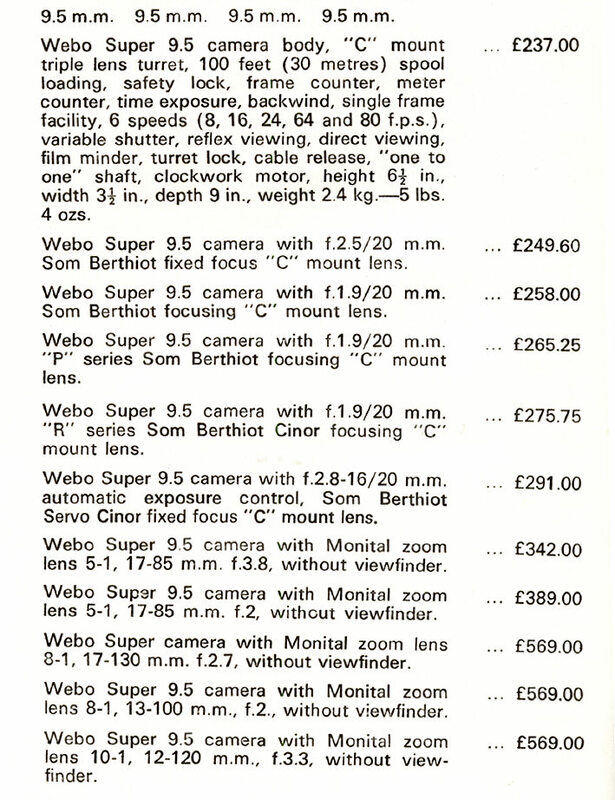 A month later a rather detailed advert appeared listing UK prices with lenses. 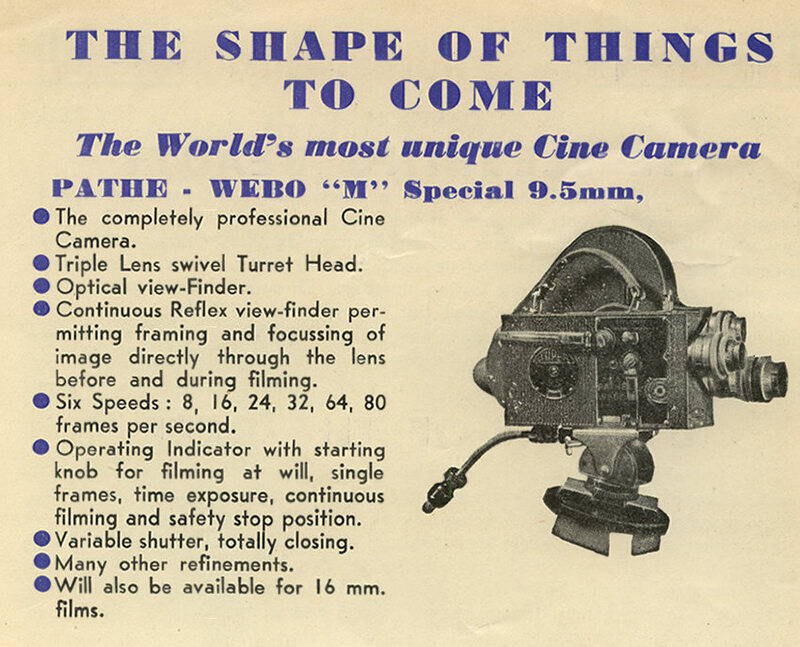 I just wonder exactly how many of these upmarket cine cameras Pathéscope managed to sell even in 16mm. 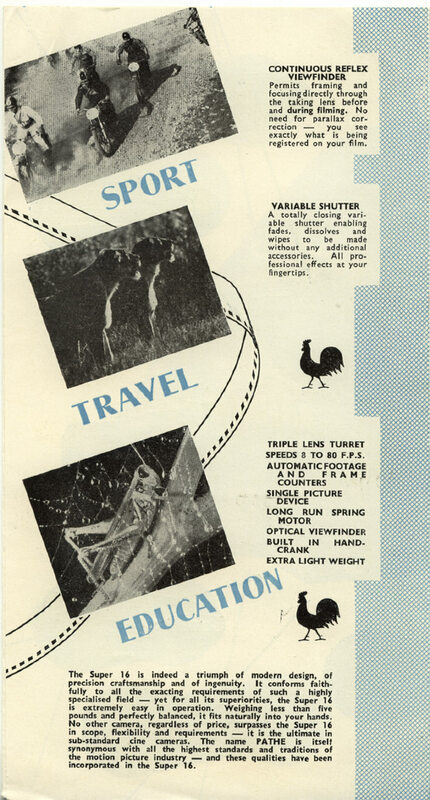 Certainly the 9.5mm film gauge, although still quite popular, had always gone for lower prices and attracted the mass market rather than the semi-professional. 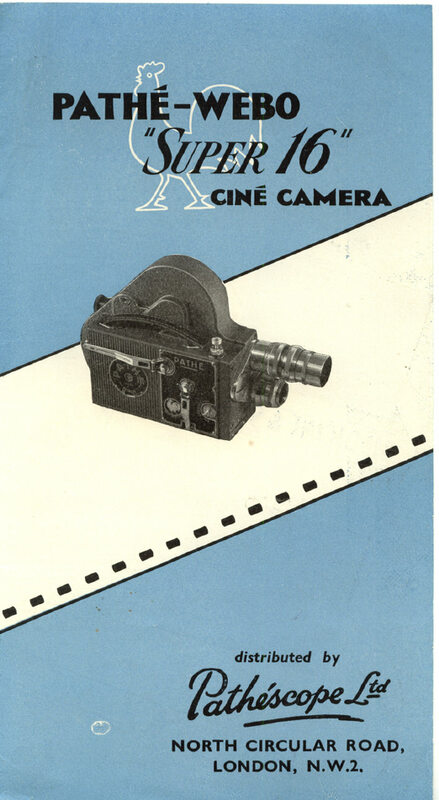 Advertising began soon in the UK during the spring of 1951 - advertised by Pathéscope themselves, a number of cine dealers also added the Webo M to their advertised range of cine cameras. 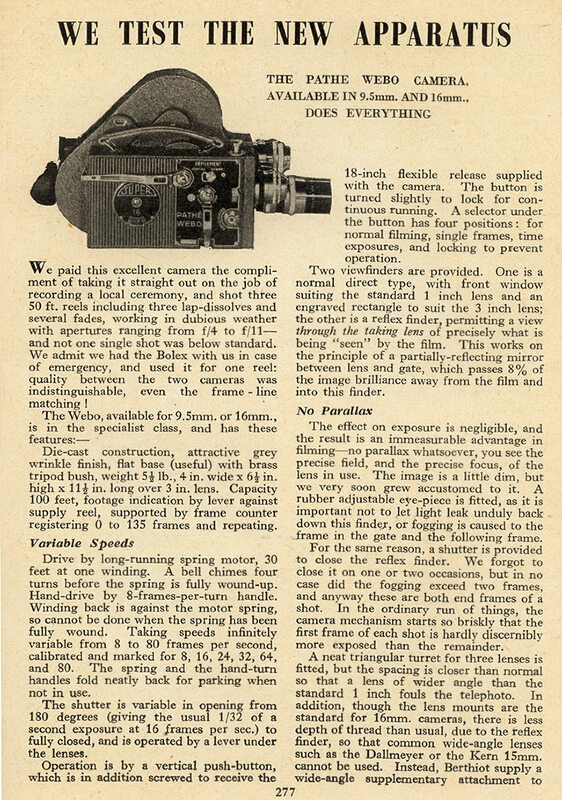 The Amateur Cine World magazine tested the Webo M cine camera in their July 1951 issue. 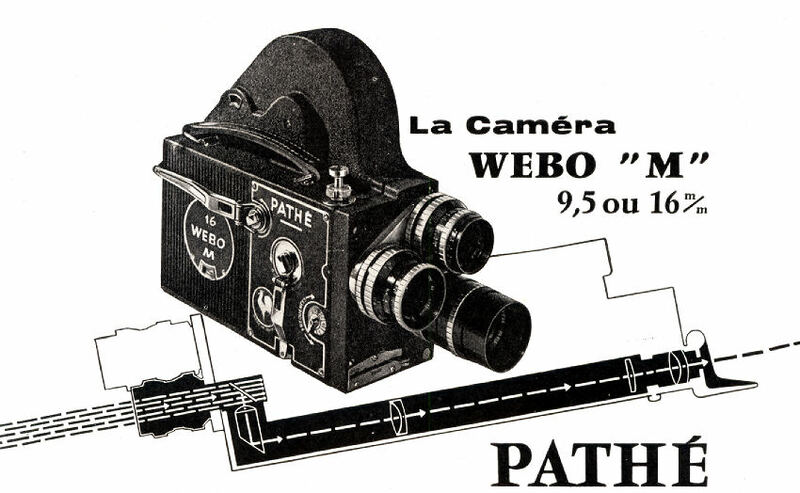 THE PATHÉ WEBO M CAMERA USED BY THE RICH AND FAMOUS! 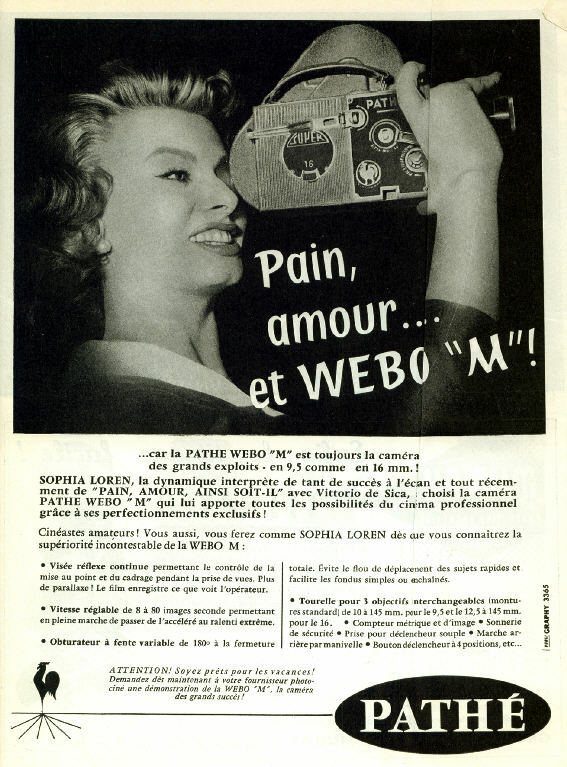 Even Sophia Loren chose a Pathé Webo M - but 16mm! In the USA we find Charlton Heston using a Webo M 60 - 16mm again of course! 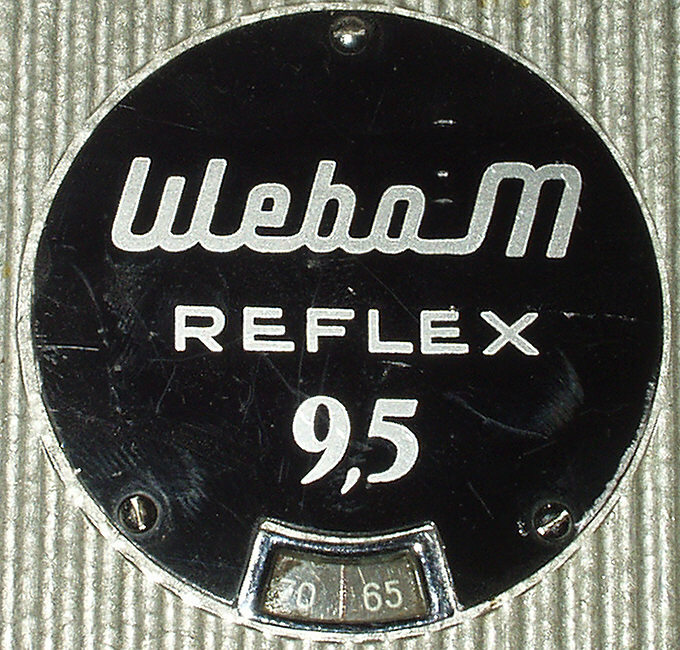 After about 1960, (hence the model name change to Webo M 60) the body colour had become grey and the reflex image was much brighter. (The brighter image was mostly achieved by only having the centre of view on ground glass for focussing; the rest left as an aerial image). This version I have, has the rigid chrome handle on top instead of a leather strap. Maybe this occured at around the same time. Certainly the badge on many examples still showed 'Super' at the top, but I guess the existing batch of badges ran out quicker on the 16mm models, than the 9.5mm ones! Whilst the earlier model had a brown leather strap, I think the Webo M 60 onwards - if it had a strap at all - had a black leather strap - well the ones I have had (or have) seem to fit this pattern. Looking at the three 'C' mount lens fittings on the turret in the photo above, the lhs is just a blank (saves letting in dirt! ), the top fitting is a turret locking device - once screwed into place, just press in the screw and screw it in - on cameras fitted with the tapped hole this will then lock the turret into place, preventing it accidentally moving out of place during use. The lens turret on the 'M 60' models and after, had a slightly larger diameter, allowing slightly 'fatter'; lenses to be fitted on the turret. Note that the turret just overhangs the operating side camera body edge. 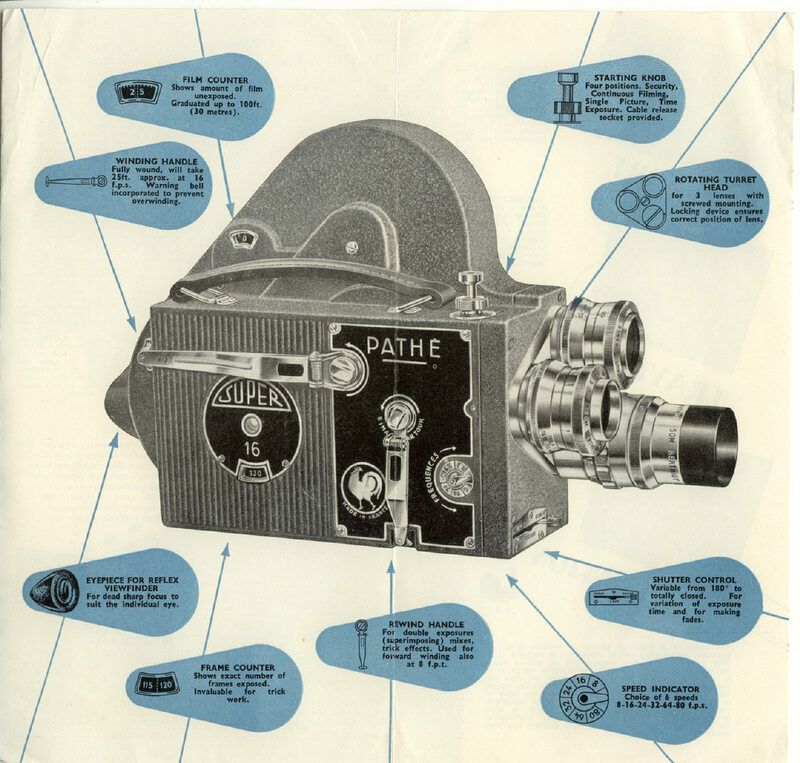 Incidentally, on most examples of the Pathé Webo M, pull out and turn the cockerel faced knob clockwise to open the camera door. The cockerel is upright for 'shut' and on its side for 'open'. The tiny lever at the bottom of the side door opens and closes the eyepiece for the reflex viewfinder. This can avoid the risk of fogging a frame of film when the cine camera is used in bright sunlight. On this model, the eyepiece has a screw which allows adjustment to suit ones own eyes or glasses. 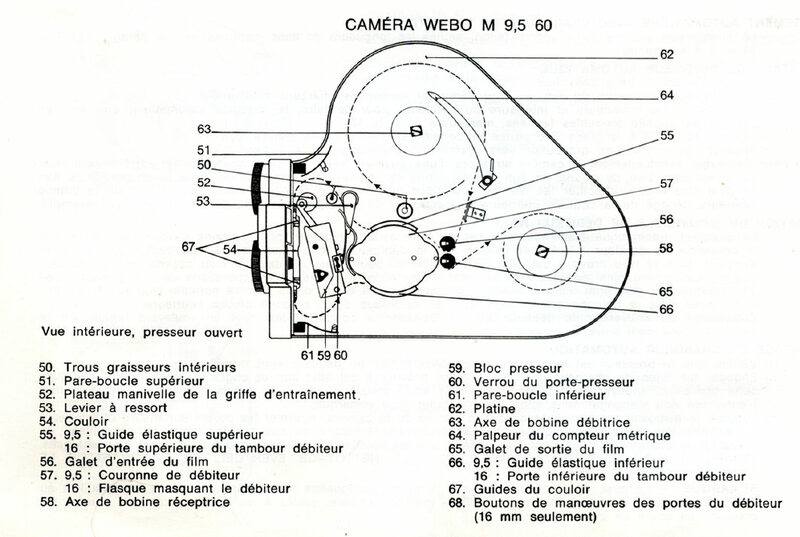 9.5mm Pathé Webo M 60 threading diagram - sorry folks this is in French but I hope to find my English one! 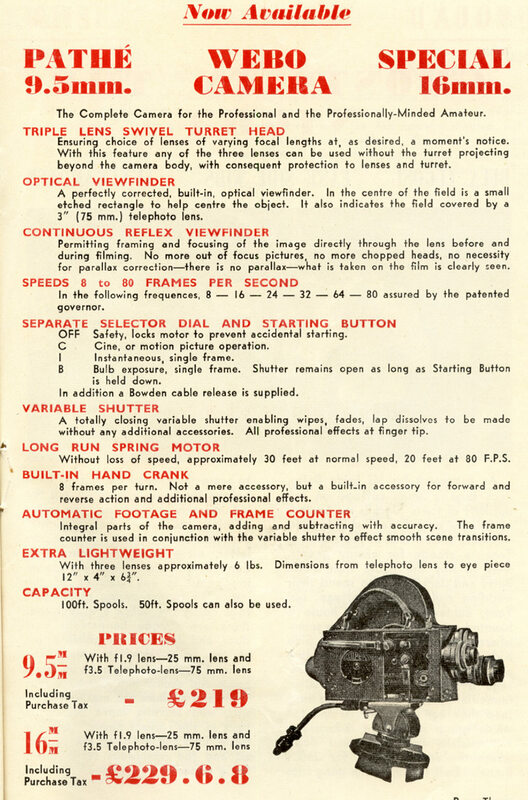 - hence this diagram has no number 68 - the sprocket film guide release buttons on the 16mm model. On 9.5mm the sprocket film guides are sprung - just push the film into position. 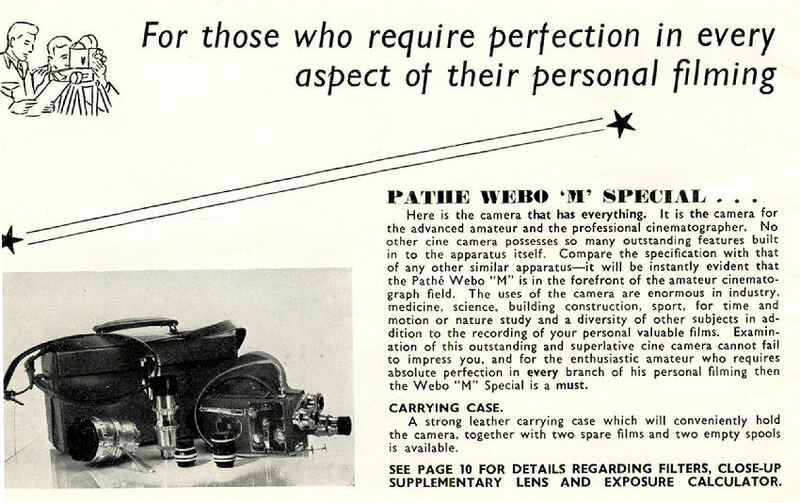 This post 1960 upgraded model (with brighter reflex finder and generally grey body colour) appears as the Webo M 60; the Webo M Super 60 and the Webo M Special; depending on what catalogue you are looking at and the language in which it is written! 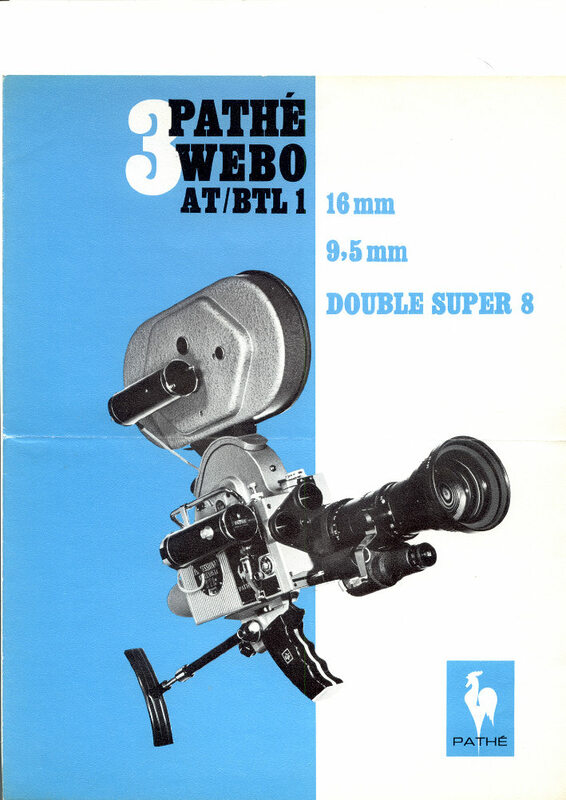 Pathéscope produced a smart three fold brochure for the Webo M Super cine camera, in fact the same leaflet was reprinted with the Pathéscope (London) Ltd name on the front in the early 1960s. I'm not sure if this was a translation of a French production or just produced for the UK; in any case, whilst prices were listed for 9.5mm and 16mm models, the leaflet just featured the 16mm model, which presumably was the bigger seller. I kept showing my Dad these leaflets, but at those prices there was no chance! To be fair I did get a new 9.5mm Pathéscope 'Prince' soon after they were introduced, but it was a half-price sale (at about £8 from a Lincolnshire camera shop I recall). Sales must have been slow even around 1960. I still have and use that camera (although with f1.9 focussing lens). 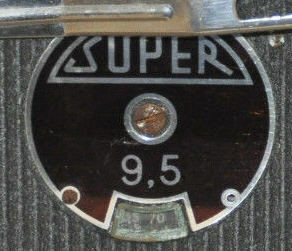 In the 1960s in the UK, the main 9.5mm suppliers Pathéscope (Great Britain) Ltd had gone into receivership in 1960 and their successor Pathéscope (London) Ltd gave up 9.5mm by 1964. From then on, the 9.5mm film gauge relied on specialist dealers and later, home 'cottage' industries to continue with limited supplies. 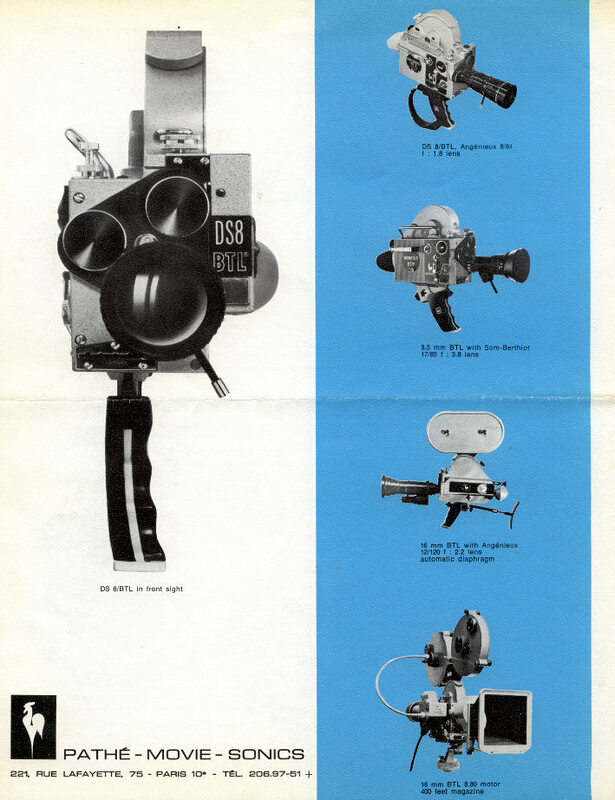 But certainly by 1969 the late Ted Smith was importing and sellling new 9.5mm equipment in the UK. 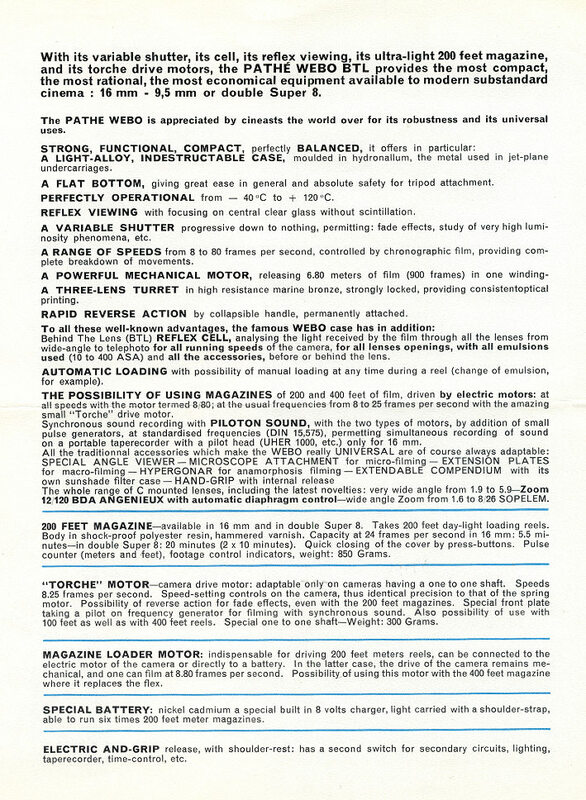 The UK Group 9.5 magazine "The 9.5 Review" of October 1969 mentions that the 9.5mm Webo M BTL was similar to the 9.5mm Webo M AT, but with built-in cadmium-sulphide Behind-The-Lens exposure metering. 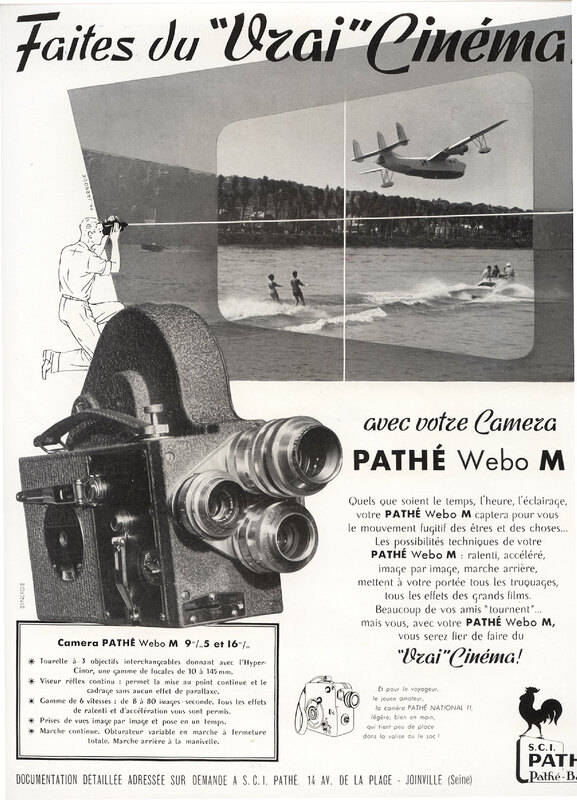 Both models had been later manufactured by a merged company in France - EPC (Erscam/Pathé/Cineric); now the Webo M cameras were being assembled (from old Pathé parts I guess) by another company Movie-Sonics. UK prices were available on application, but were rather high! 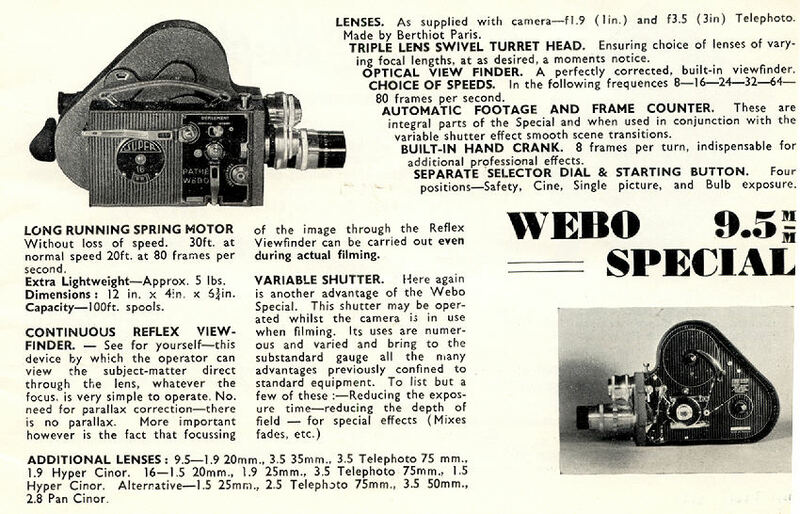 The Webo M AT model obviously belonged to the later design (M 60 or Super or Special) that had improved brightness for the reflex viewing. As well as retaining these features of 100 foot / 30 metre spool loading, 8 to 80 frames / second filming speeds, single frame and time exposure, variable shutter with automatic fade setting, backwind, metric film counter and frame counter, triple 'C' mount lens turret; this model also had provision for electric drive motor coupling. The ultimate Webo M, but not in 9.5mm!! This advert (in French!) dates from 1968. 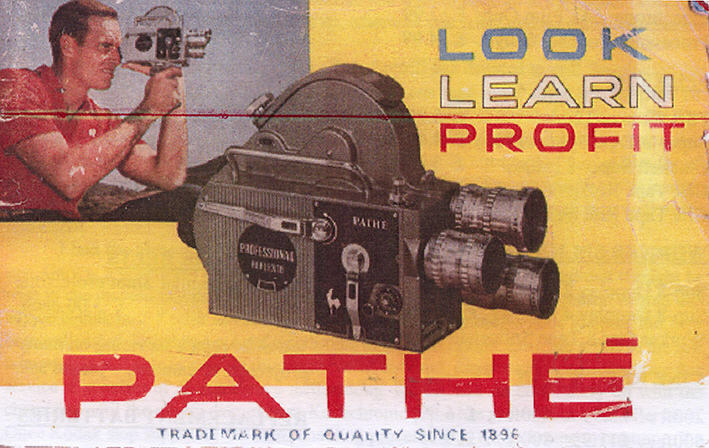 By then the home movie side of Pathé had initially morfed into E.P.C. 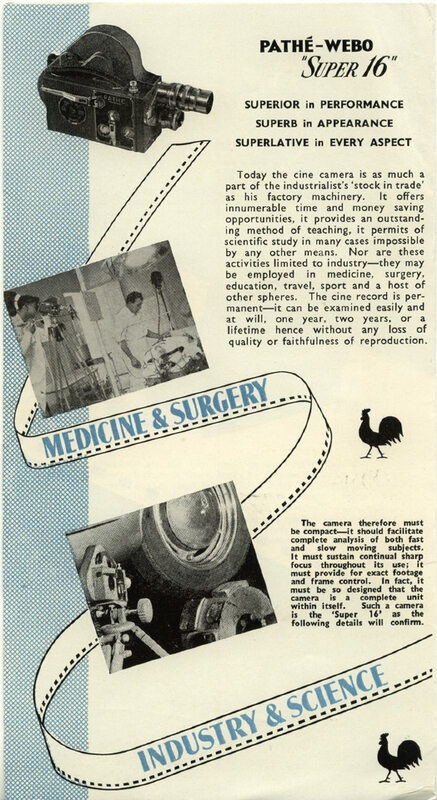 (Erscam / Pathé / Cineric) which finally became Moviesonics. 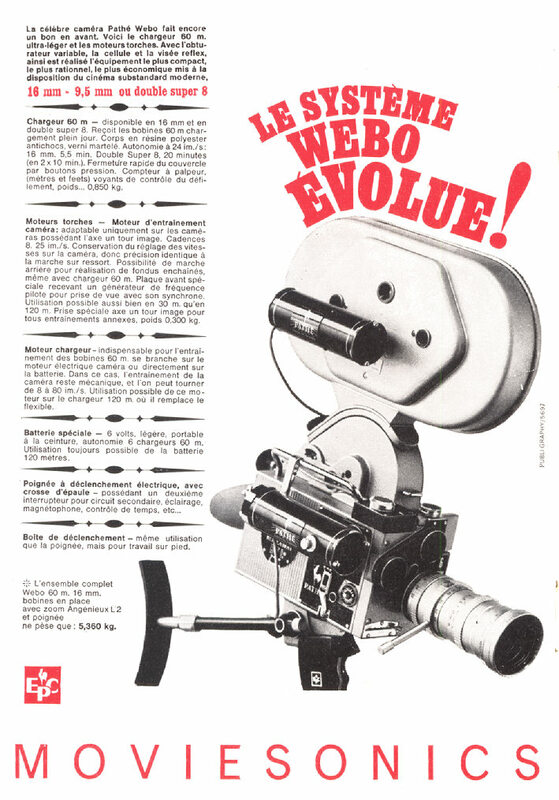 By now the Webo M range had been made available in a Super 8mm model (taking 'double Super 8mm' film on spools). The model shown above could take up to 60 metre / 200 foot spools in the top mounted extra film chamber; it could also have electric motor drive. 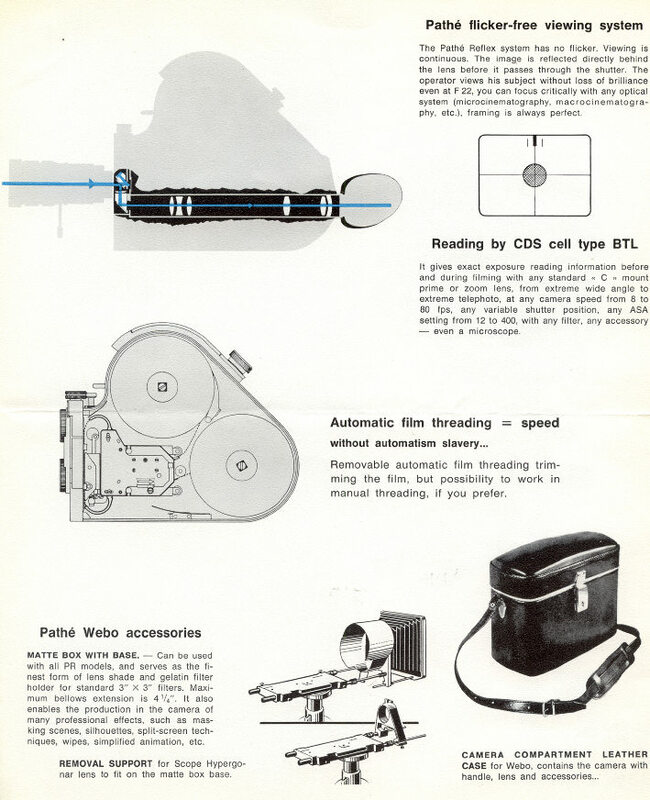 Most 16mm versions were intended for TV or semi-professional work - the model AT (think this stands for 'auto-thread') was also supplied in 16mm as AT 120M which could take up to 120 metre / 400 foot film spools. 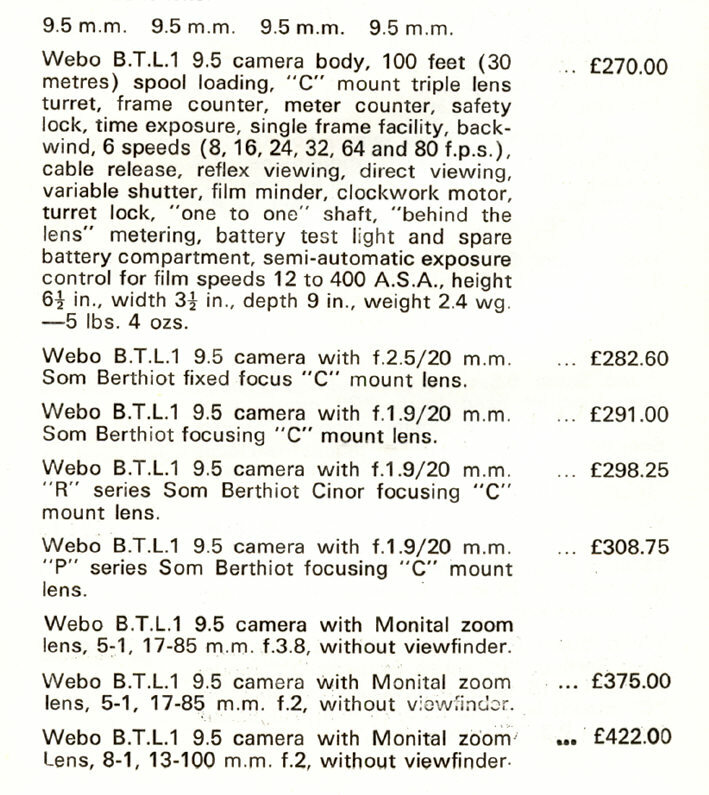 But at that time, the catalogue just listed the good old basic 'M' model in 9.5mm, plus the 'M AT' (possibly meaning 'auto-fade' as I don't ever think 'auto-thread' featured on the 9.5mm versions) and the 'BTL 1' which featured the behind-the-lens CdS cell exposure metering. Whilst searching for my Webo M instruction book in English (which must be somewhere safe!) this leaflet in English for the later AT/BTL turns up! You have to read carefully to discover as we know from above, that not all the 'goodies' were in the 9.5mm version. (Bother, and I am really sure I would have bought one - well if I had the money - more like a new car I guess!). I still have a catalogue from later indefatigable 9.5mm dealer the late E.M. (Ted) Smith - the letter enclosed is dated 1973. From odd crossings out, I think Ted was still trying to shift old stock! However we can see below, that he had both the 9.5mm Webo M Super and the 9.5mm Webo M BTL in stock. I wonder if he had any sales though? Unfortunately I can't give him a ring to check, as he sadly died just a few weeks ago as I write this piece (March 2016). 1. A camera desperately sought after by UK ninefivers! 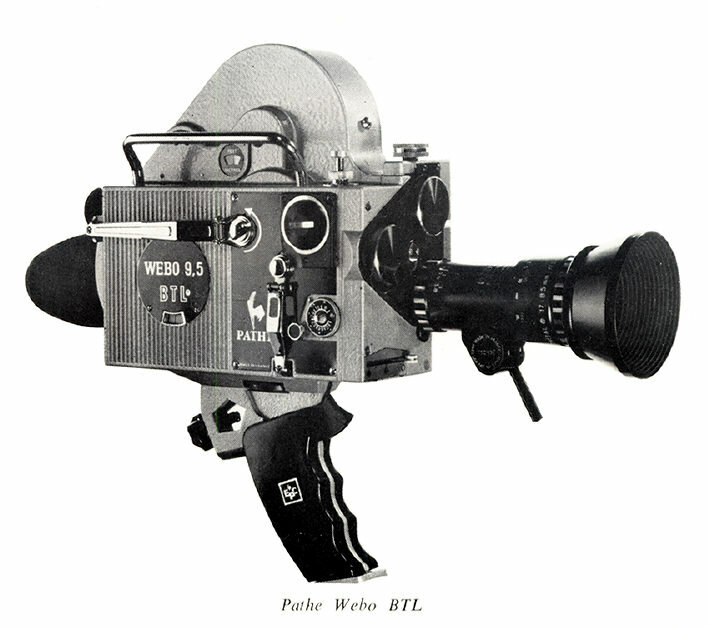 In the UK, 9.5mm was sold as a cheap home movie film gauge for the masses - hence few Webo M's were sold. 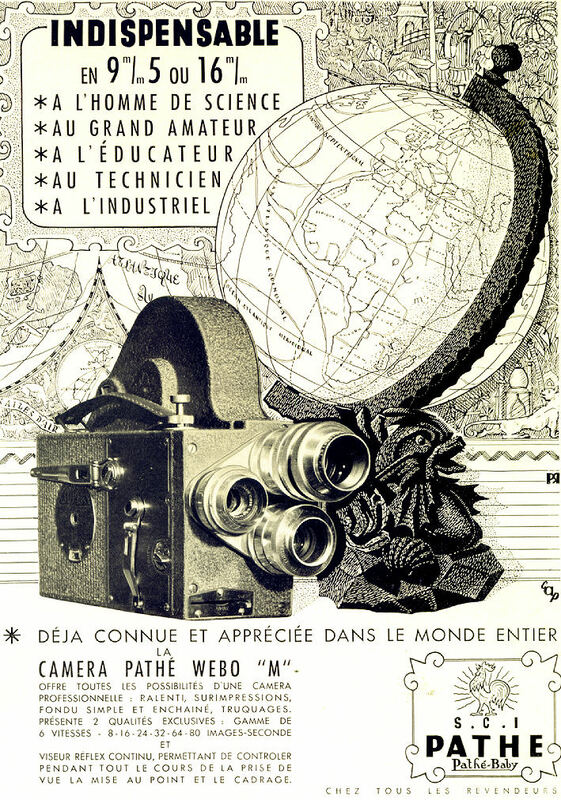 In France where 9.5mm was marketed more for quality, many examples turn up. However whilst the reflex viewing and focussing make it ideal for titles etc. the camera is not really durable enough for heavy work. 2. 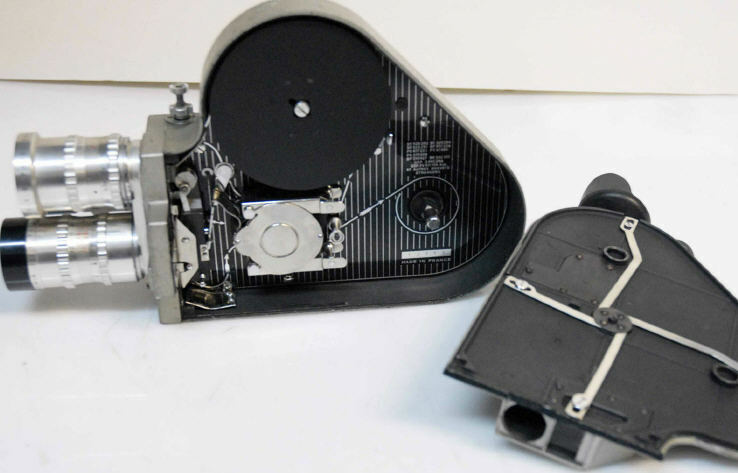 The lack of spung edge guiding for the film gate can result in some side weave and the spool loading needs extra care to avoid considerable film fogging during film loading/unloading. (I used to load the camera in shade and unload it in a changing bag). 16mm has a far less problem with edge fogging because the photographed image does not reach to the edges of the film. 3. The sheer size and weight of this cine camera really demands a good tripod for most shots. 4. A body colour change from brown to light grey (or maybe sometimes a different shade of grey), signals a massive improvement in the brightness of the reflex viewfinder. On later cameras like one pictured above, the leather strap was replaced by a chrome grab bar. In addition a small increase in the diameter of the lens turret allows the fitting of slightly 'fatter' lenses. 6. Whilst the Webo M accepts all 'C' mount type lenses, the three lens mounts are quite close together on the turret. Although all the original lenses supplied by Pathé / Pathéscope (normally Som Berthiot or Angenieux) will fit together fine; it is best to check other lenses to ensure they will all fit together on the turret (slimmer lenses are best!). Incidentally lenses with long threads may also not fit correctly as the threads in the lens turret are quite short. 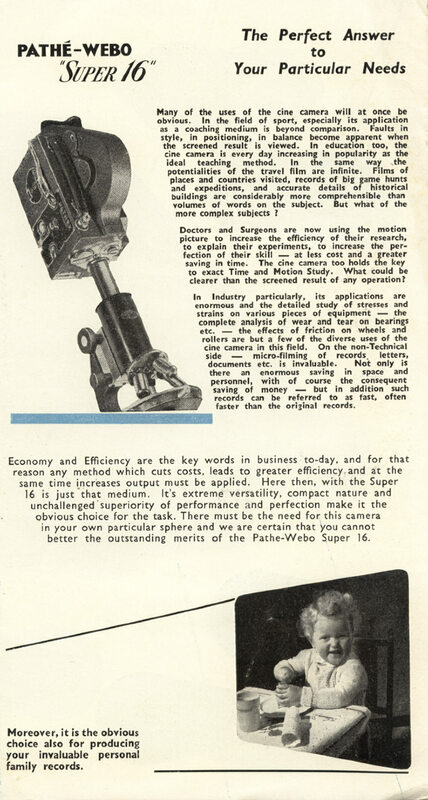 Webo M cameras after about 1960 seem to generally have a marginally larger diameter lens turret, giving a little more space for 'fatter' lenses. 7. 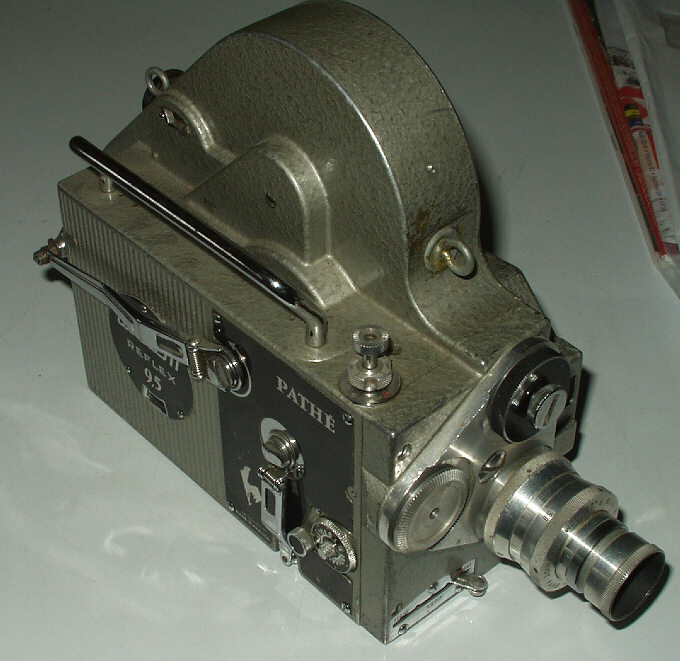 Certainly in the UK, maybe abroad, a number of 16mm Pathé Webo M cine cameras were converted to 9.5mm. Check the badge on the side (as at the top of this page) and inside for any 'engineering' giveaways! Sadly a list of production serial numbers would be very useful in this identification. 8. Many 9.5mm models are fitted with 25mm focal length standard lenses the same as their 16mm counterparts. 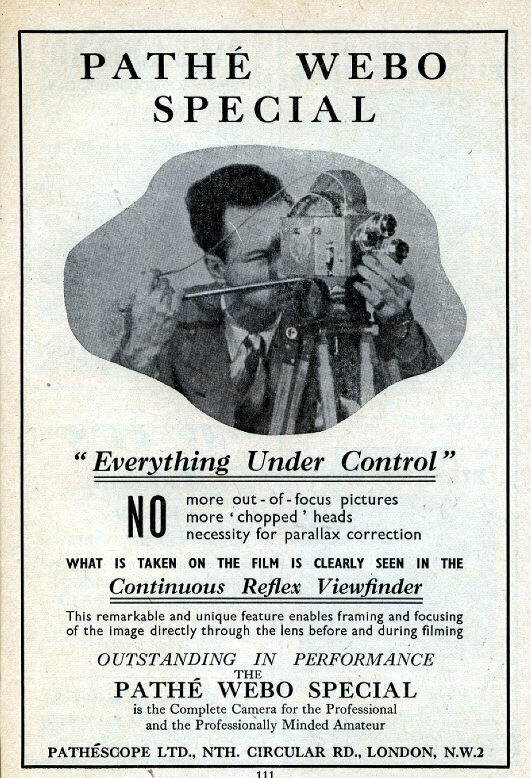 Most 9.5mm film makers agree that the better focal length for the standard lens on a 9.5mm cine camera is 20mm. 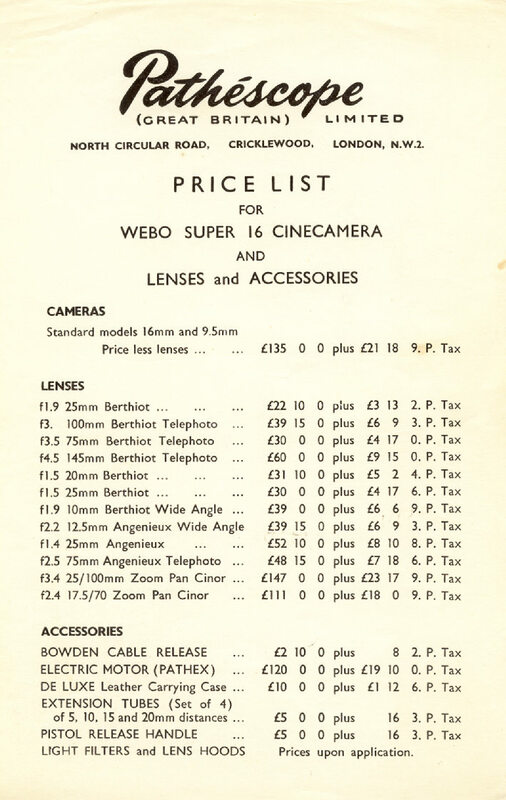 Generally 9.5mm Webo M cine cameras later imported to the UK were supplied sensibly with 20mm focal length standard lenses. 9. Take care when using longer telephoto lenses - the end of the lens may just mask the edge of the image of the standard lens. At least the reflex viewfinder will identify this problem!